More than 78,135,012 beer lovers served! Hours: Wednesday-Friday 2:00pm-3:00pm, Saturday 10:00am-2:00pm. 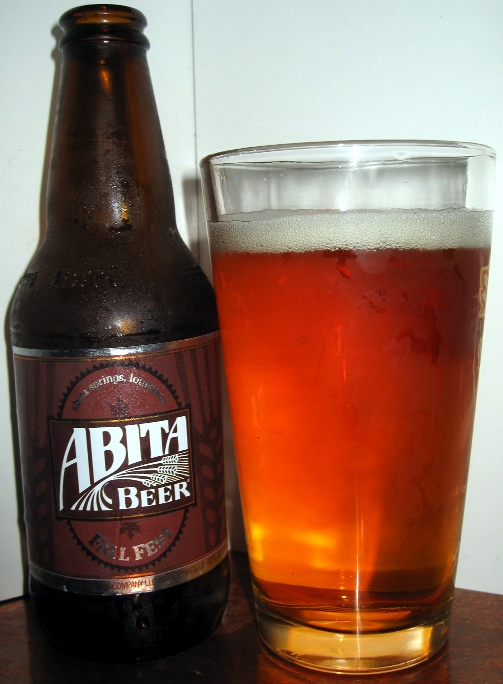 Abita also operates a "brew pub" in their original location at 72011 Holly Street in Abita Springs. They don't brew there anymore, but it's a full-service restaurant serving all of their beers. They're closed on Mondays. Chewy, fizzy. Lots of dark Munich / Special B maltiness. Nicely spicy and just a little warming. Medium — surprisingly light — body. Smooth. Nicely malty, mildly grainy. Maybe some alcohol. Good Helles Bock. Weak Doppelbock. Medium body, smooth. Big biscuity malt. 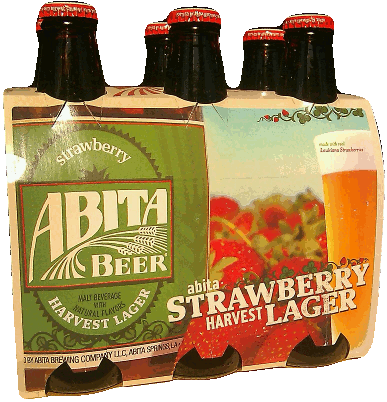 Mild fruity hop flavor. Low bitterness. Good clean beer, somewhere between a Helles and a Dunkles, but not quite spicy enough for a Vienna. Amber, high carbonation, nice head. 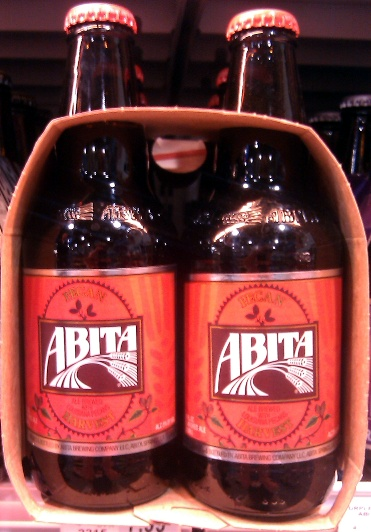 Malty, toasty, caramel aroma, with a hint of diacetyl. Light-medium body, big malty toasty flavor nicely balanced by spicy hops. Light body, sweet and smooth. Nutty, mildly grainy. Fruity. Some DMS. Clean finish. Medium body, smooth. Big sweet caramel malt, big citrusy fruity hops. Nicely bitter. Medium body, fizzy. Smoothly malty, a bit sulfury, grainy, grassy. Low bitterness. No alcohol sensation. Light and fizzy. Sweet and nutty, really toasty. Sweet grassy clean finish. Amber. Big head didn't last very long. Fairly hoppy aroma with some diacetyl. Medium body, fizzy. Lots of sweet malt flavor. Mildly bitter. Big sweet finish with some DMS. Light-medium body, smooth. Fruity esters and fruity hops. Low bitterness with mild biscuity malt. Sweet clean finish. Black. Low dense brown head. Rich chocolate. Mildly toasty, grassy. Big and chewy, but more like an Oatmeal Stout. Chocolatey, toasty, a bit grassy, and nicely bitter. Mild, as Imperial Stouts go, but damn tasty. Medium body. Big grassy bitterness up front gives way to bready malt flavor. Grassy hops in the clean finish. 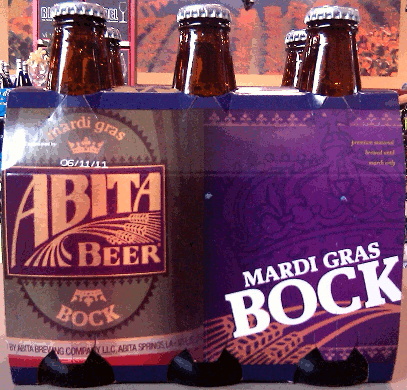 Abita donates some of the proceeds from this beer to the Gulf oil spill cleanup effort. Bright tawny-amber. Big thick head. Sweet, grainy aroma, with DMS. Light body. Mild biscuity maltiness all the way through. Mild spicy hop flavor. Some DMS and some diacetyl. Very very dark red. Dense head. Medium-big body, almost creamy. Roasty, toffee, malty. Chewy. Tastes real good with this duck sandwich! Deep red. Thick head. Sweet and toasty aroma. Medium fizzy body. Lots of sweet toasty malt. Finishes quite sweet. Deep dark red. Big thick head. Smoky butter aroma. Medium fizzy body. Sweet and roasty with lots of diacetyl. Dark dark dark dark red. Smoky aroma, hint of sourness. Light body, very earthy, mildly bitter. Dark opaque brown-red. Smoky-caramel aroma. Thick, sweet, smoky, bitter, hi-test, caramel, molasses.